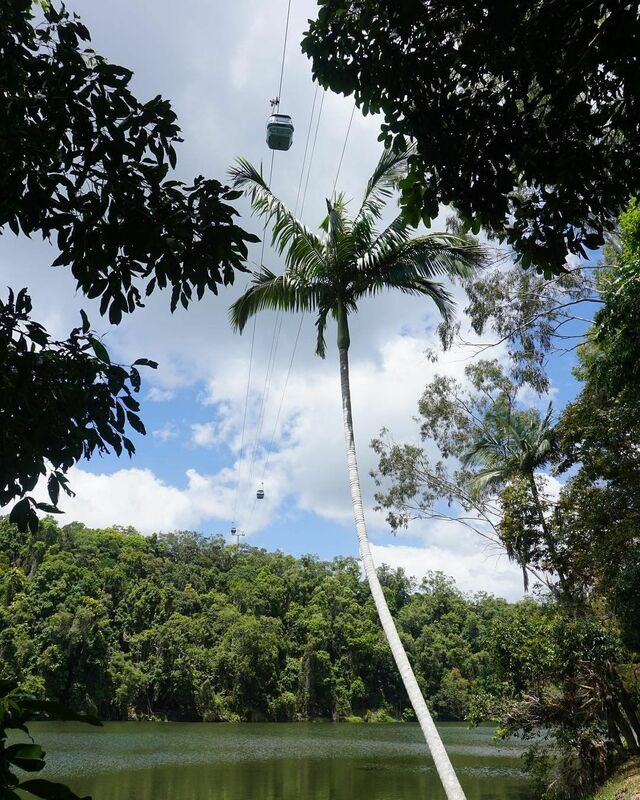 The Skyrail Rainforest Cableway is a well known Cairns attraction that may be enjoyed as a half day activity, complete day tour or combined as a package with Cairns other leading tour attractions to create the perfect ancient rainforest itinerary. Skyrail is a unique rainforest experience taking you on an unforgettable journey through Australia’s World Heritage listed Tropical Rainforests. Embark on a fascinating journey of discovery over and deep into the world’s oldest continually surviving tropical rainforest. The iconic Skyrail experience is a must do Cairns attraction that provides a truly unique perspective of Australia’s World Heritage-listed tropical rainforest – immersing guests in the sights, sounds, smells, and tranquility of one of the most botanically fascinating areas on earth. Soaring through the treetops of Barron Gorge National Park, the 7.5-kilometer Skyrail Rainforest Cableway offers an unforgettable outdoor experience. Located twenty-five kilometers from Cairns city. Located on the Atherton Tableland at the summit of the McAlister Range, Kuranda is a small town. The town is surrounded by the World Heritage listed tropical rainforest of Northern Queensland. Over time it has grown to become a must-see destination for visitors to Cairns. 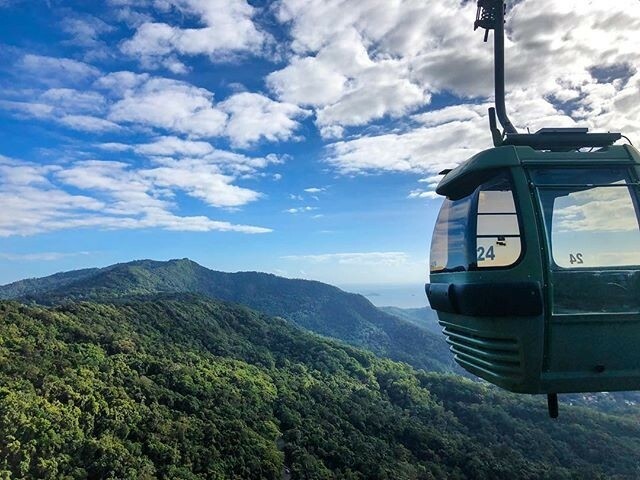 Because of Kuranda’s stunning location, both the Kuranda Scenic Railway and Skyrail Rainforest Cableway provide visitors with breathtaking views of swathes of lush rainforest. 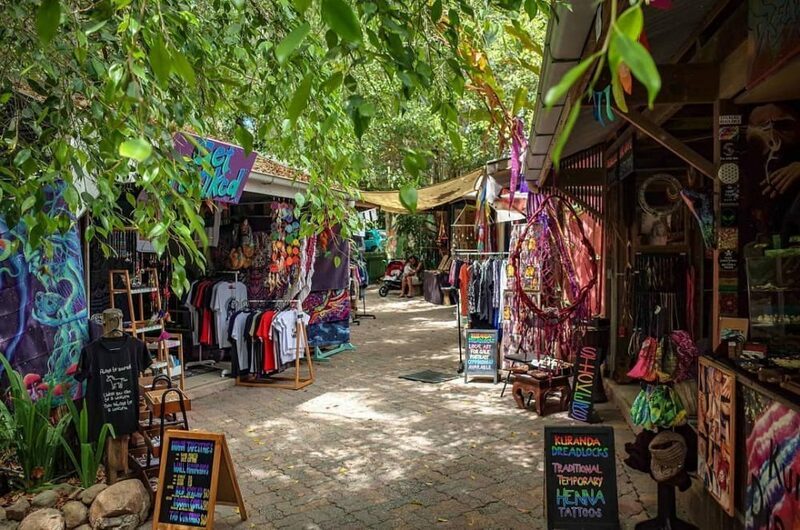 Despite its far-flung location, Kuranda is home to many modern amenities, and visitors will be pleasantly surprised to find a whole host of shops, restaurants, and cafes. There are also several markets at which Australian-made crafts and local produce can be purchased. 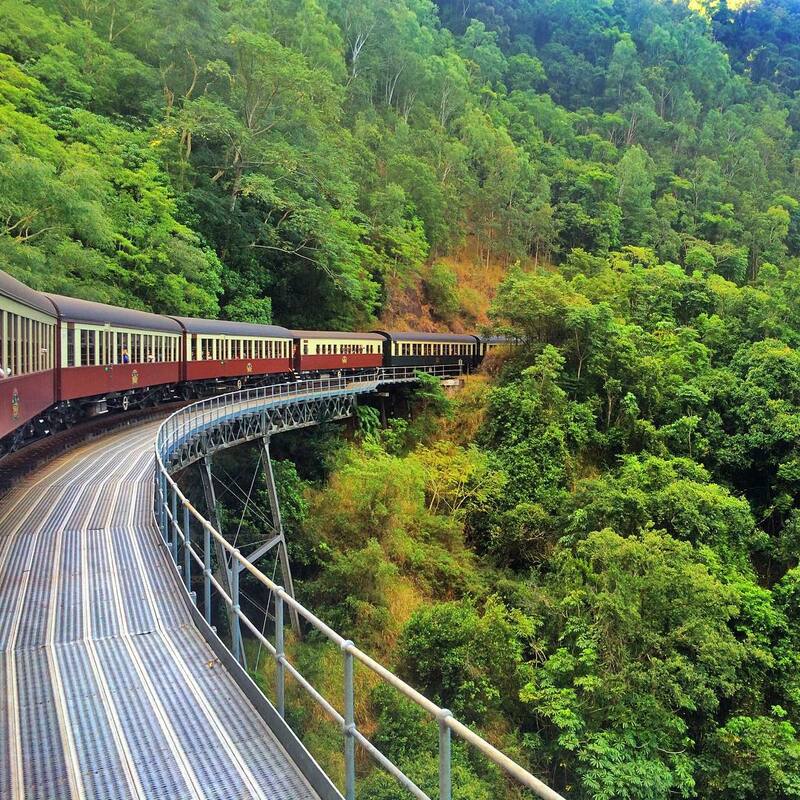 There is no shortage of sights and activities for nature lovers in Kuranda. Skyrail Rainforest Cableway is a 7.5 km scenic cableway running above the Barron Gorge National Park, in the Wet Tropics of Queensland’s World Heritage Area, North of Cairns. It has won more than 25 awards. Skyrail Rainforest Cableway journeys through the world’s oldest continually surviving rainforest on earth, older than the Amazon Rainforest. It was the only Australian finalist in the 2014 International Tourism for Tomorrow Award. In 2012, it was the first tourist attraction in the world to receive Platinum EarthCheck Accreditation. Skyrail Rainforest Cableway traverses the McAlister Range, through the Barron Gorge National Park, taking guests on an amazing journey between its Smithfield and Kuranda Terminals. Guests glide just meters above the rainforest canopy in Skyrail’s comfortable six-person gondola cabins. It provides spectacular and uninterrupted views of the rainforest such as tropical Cairns, the Coral Sea, and the lush Cairns Highlands. Witness the wonders of the world’s oldest continually surviving rainforests from Skyrail’s unique vantage point. Before alighting at Skyrail’s two rainforest mid-stations to explore and learn more about this fascinating environment from the forest floor. At Red Peak Station, qualified Rangers provide regular guided boardwalk tours sharing their knowledge of this ancient environment and answering visitor questions. While the Rainforest Interpretive Centre at Barron Falls Station provides a fun and informative learning experience for people of all ages. You can experience Skyrail Rainforest Cableway (and Kuranda Scenic Railway) at either end of the day however for self-drive visitors. We recommend you enjoy Skyrail Rainforest Cableway in the morning. You will find that there is plenty of parking at Skyrail (including oversize spaces for RVs, caravans, and campers). You don’t have to wait for transfers to Freshwater Station, Canopy Cafe to enjoy a drink or snack and also a short transfer turnaround back to Skyrail and your vehicle when you arrive on the train in the afternoon. Traversing the ancient rainforest between Smithfield and Kuranda, a one-way Skyrail Experience will take approximately 90 minutes to complete. For a return (round-trip) experience, you should allow 2 and a half hours. Skyrail’s Smithfield Terminal is located approximately 15 minutes’ drive from Cairns city and 50 minutes’ drive from Port Douglas. Both locations are conveniently serviced by regular coach transfers. Self-drive guests have access to free parking for cars and RV’s/caravans. Skyrail Rainforest Cableway is open every day except for Christmas Day and during planned, preventative maintenance. The Skyrail will take approximately 1 and a half hours one way, or 2 hours return including time spent at the two rainforest stations. It can commence or conclude at either Smithfield or Kuranda, depending on your direction of travel. The flexibility of Skyrail allows this unique rainforest experience to be enjoyed in a few hours, or extended over an entire day. Glide just above the pristine rainforest canopy before descending to explore the forest floor at the Red Peak and Barron Falls Rainforest Stations. 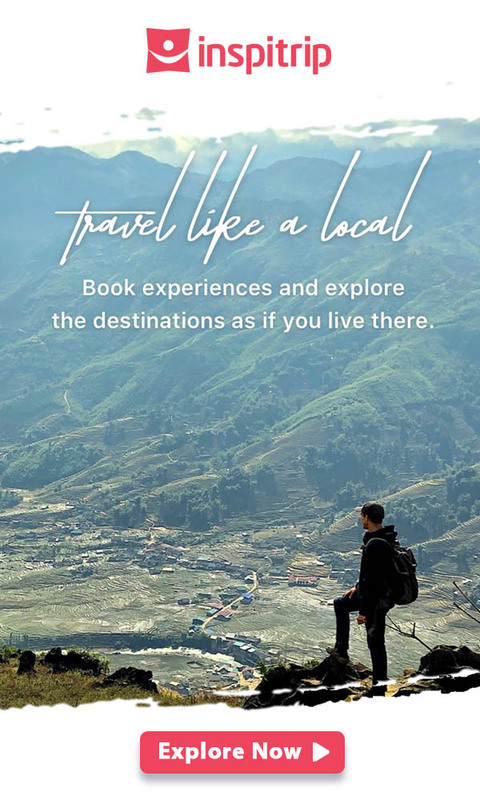 Complimentary ranger-guided boardwalk tours, the rainforest boardwalk loop and scenic lookout at Red Peak Rainforest Station unlock for you the secrets of this mystical landscape. You can also package with Cairns’ other leading attractions such as the Kuranda Scenic Railway to create an unforgettable day tour. Discover more via the Skyrail-CSIRO Rainforest Interpretation Centre at Barron Falls Rainforest Station. Marvel at the rugged beauty of the Barron Gorge and Falls which you can enjoy from any of the three lookouts, and learn more about the area’s pioneering past at the engaging historical precinct. The uniqueness of the Skyrail experience is epitomized by the purpose-built gondolas that offer a sustainable birds-eye view of North Queensland’s living natural wonder that is recognized as one of the most botanically fascinating areas on earth. Located just 15 minutes from Cairns city center, 10 minutes from Palm Cove and 50 minutes from Port Douglas, Skyrail is accessible to people of all ages and abilities. Glide over North Queensland’s UNESCO World Heritage-listed tropical rain forest and enjoy unbeatable aerial views over its forests, gorges, and waterfalls. Skyrail’s Smithfield Terminal is located just 15 minutes from Cairns and provides a convenient embarkation or disembarkation point. You can access the terminal easily by Skyrail’s coach or day tour transfer services and self-drivers can avail themselves of the ample, free, on-site parking. The terminal’s wide access ramp is framed by lush vegetation such as a beautiful example of the ancient King Fern and a range of native orchids. Inside you’ll find a range of facilities including ticketing, souvenir and gift shop. The Canopy Café serving a range of hot and cold drinks, meals and snacks, restrooms and a Skyrail Rainforest Foundation information and donation point. The travel time between Smithfield Terminal and Red Peak Rainforest Station is approximately 10 minutes. Take the time to enjoy spectacular World Heritage listed aquatic, coastal and rainforest views of Cairns and the Coral Sea, as well as Skyrail’s rainforest regeneration corridor. Descend through the canopy layers and deep into the forest for your first stop. Red Peak Station, where complimentary ranger-guided boardwalk tours, interpretive signage, and scenic lookouts will unlock the secrets of this ancient landscape. This is the domain of lush fern gardens, climbing palms, and imposing rainforest giants. All of which are in constant competition for life-giving light. 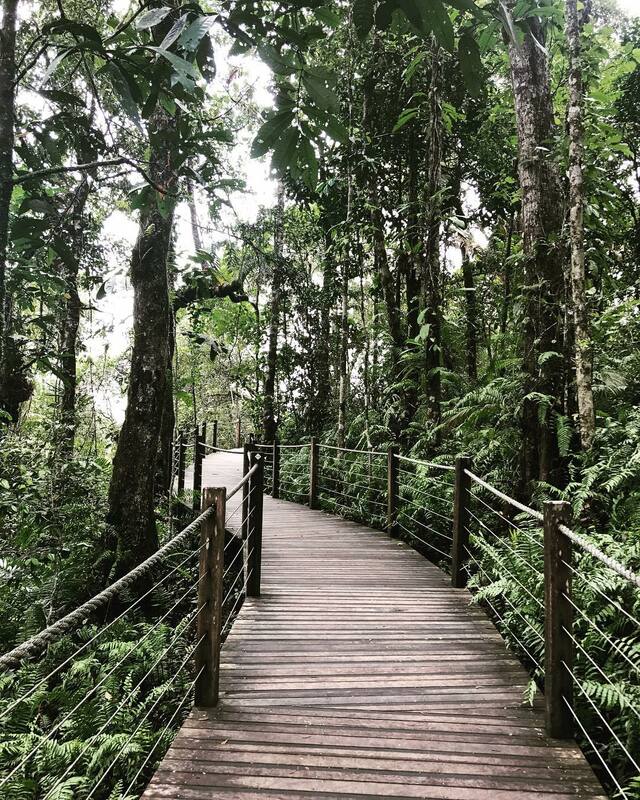 Gain a first-hand insight into this ancient landscape from our rangers who will guide you along the rainforest boardwalk that meanders through the dense understory. Their intimate knowledge of the area will bring the fascinating story of the rainforest to life. Explore the Rainforest Discovery Zone that holds the secrets of this mystical landscape whose prehistoric ancestry dates back approximately 130 million years. Navigate the evolutionary history of the Earth via the illuminated timeline that snakes its way along the ceiling; discover the amazing facts, flora, and fauna of the rainforest contained within the large, floor to ceiling interpretive panels; step inside Australia’s most realistic jungle habitat of the primordial cassowary. You don’t want to miss this is an exclusive rainforest experience. Give yourself time to encounter, discover and immerse yourself in this fascinating living museum. At 545 meters (1788 feet) above sea level, Red Peak Station is the highest point of your rainforest journey. It is approximately 10 minutes from the Smithfield Terminal and approximately 15 minutes from the Barron Falls Station. The approach to Barron Falls Station brings with its spectacular views of the Barron Gorge National Park. It can be further appreciated from the three separate lookouts. The Barron Falls site itself has an interesting history. Once the construction base site of the hydroelectric development in the 1930’s. A display of some of the machinery used in the construction provides a fascinating insight as to how the development was undertaken. While it is a spectacular sight at any time of the year. The Barron Falls really comes into its own during Cairns’ wet season (December to March). When tropical rains help feed its dramatic descent. The station is also home to the Rainforest Interpretation Center. Developed in conjunction with Australia’s premier scientific research organization. The center houses a range of audio, visual and interactive presentation materials that the whole family can enjoy. 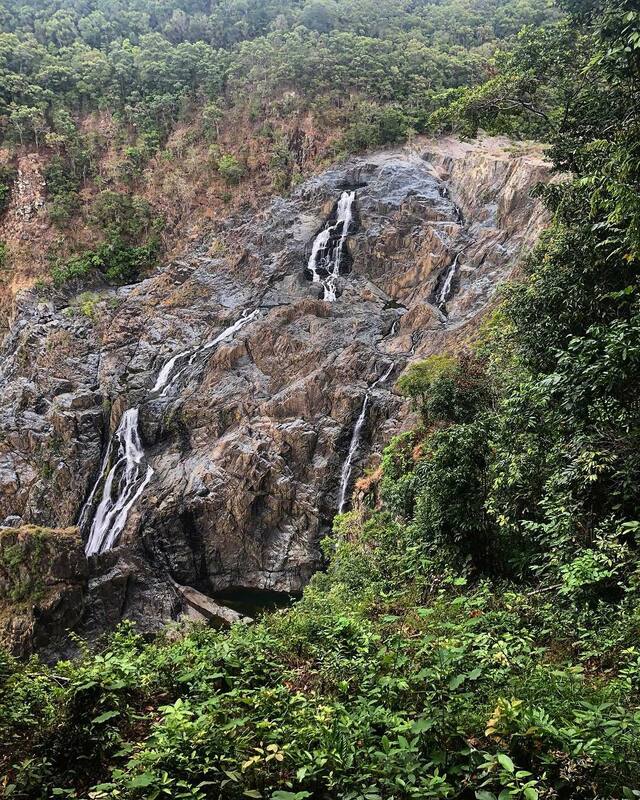 From Barron Falls, your Skyrail experience continues over the pristine rainforest canopy. It gives way to the mighty Barron River that you’ll cross on your approach to Skyrail’s Kuranda Terminal. Conveniently located next door to the Kuranda Scenic Railway Station. Once inside the terminal, you can view your personalized photo, browse the souvenir shop for a unique memento of your rainforest experience and enjoy a range of cold drinks and snacks. 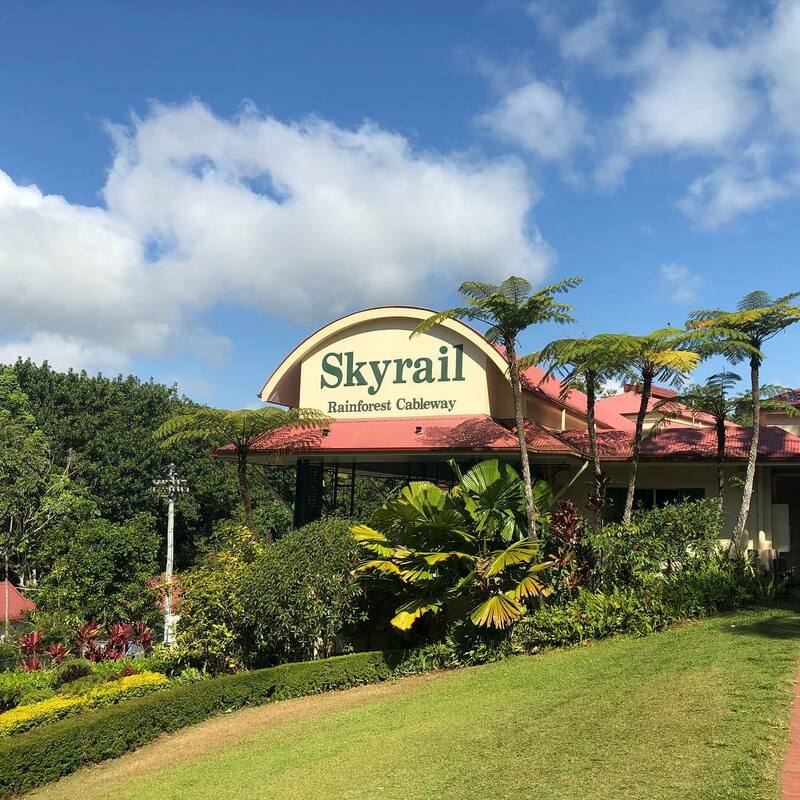 Guests commencing their Skyrail experience from Kuranda can also purchase/collect their boarding passes at the terminal. Skyrail’s Kuranda terminal is located next to the Kuranda Train Station (home of the Kuranda Scenic Railway) and a short walk from Kuranda village. Self-drivers can avail themselves of the free parking located in close proximity to the terminal. It is about 1.5 hours for the one-way Skyrail experience taking into account 20 minutes for each station stop. Visitors have options of taking it one way up or down the mountain or round trip. Fold-up baby strollers can be taken into the gondolas as well as standard wheelchairs. They’re open every day except Christmas. Look into the 40-minute walk with a local guide – the Djabugay Aboriginal Guided Walking Tours. We wish we had more time to do this one since it looked so interesting. The river you pass over near Kuranda comes from the Tropical Highlands and flows into the ocean near Cairns International Airport. Skyrail has a foundation through which visitors can contribute to protect tropical rainforests through research and education.